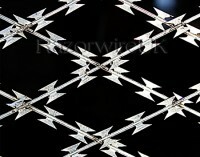 Razorwire Flat profile – a useful alternative to Concertina Razorwire. 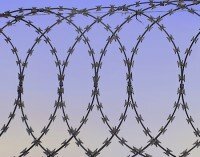 When the over hang of concertina is a problem, for instance if the protrusion of Concertina Razor wire beyond your boundary is a problem then Flat profile being vertical solves this issue. The other advantage is its neater in appearance than Concertina and is also very easy to fit. 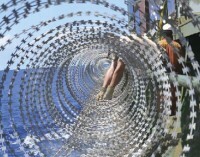 Installation of Razor Wire (flat profile) is particularly simple. 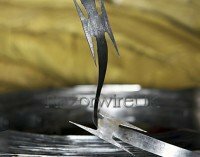 It can either be supported by clipping or wire tying to the surface part way up or alternatively by fitting brackets to the existing fence posts and then running a line of support wire through the top hole of the bracket and weaving it through the Razor Wire. Either way we can supply you with the necessary vertical uprights, straining wire and bolting to enable self fit to a fence or wall.